Online sales and person to person transactions are incredibly popular. Facebook groups like For Sale, Wanted or Free in Acadiana, and hundreds of others like it, list items for sale within the local community. People regularly sell items in local newspaper classified ads. Craigslist sells millions of items every year. You can buy anything online. Craigslist is often described as a cesspool of crime. Since 2009 there have been 45 known murders related to a Craigslist interaction and 58 accused or convicted murderers. Hundreds of robberies have occurred at transaction meetups. Unfortunately, meeting strangers to exchange your goods can get you robbed or worse. A lot of for sale listings are set up as intentional scams. Police have labeled Craigslist crimes “robbery by appointment”. Criminals use the website to identify victims and schedule their opportunities to rob them. Anonymous internet meetup crimes has become so rampant that Craigslist has begun recommending meeting at police stations. It’s not just Craigslist, there are local online Facebook groups that offer buy, sell or trade opportunities for people in their geographic location. Meeting a complete stranger from the internet in person can be dangerous. As a result, law enforcement agencies across the country are creating Safe Transaction Zones. These areas are designated meetup locations. 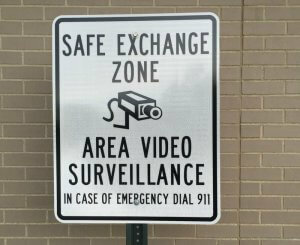 The zones are well lit, under 24 hour video surveillance and often located in police station parking lots. Buyers and sellers are encouraged to use the sites as a safe area to conduct legal business. It is still advisable to meet during daylight hours. Tell a friend where you are going, bring a friend if possible. If the individual you are buying from or selling to is unwilling to meet at safe zone, do not meet them. Be extra careful when dealing with high value items. Take your cell phone with you. Trust your instincts. Above all, it’s always better to be safe than sorry. Safe Transaction Zones are also being used as neutral meetup locations for custody and visitation exchanges between parents in contentious relationships. In Louisiana there are at least eight cities with meetup sites and more to come. If your city does not have an official meet-up location, meet in lobby of the police station. Never meet anyone at your home or their home. Always use public areas. Exercise caution when dealing with strangers. Lafayette at the Police Department on E University Ave.
Morgan City at the Police Department on Myrtle St.
Baton Rouge at the Police Headquarters on Airline Hwy. Natchitoches at the Police Headquarters on Amulet St.
Luling at the St. Charles Parish Sheriff’s Office on Judge Edward Dufresne Parkway. Colfax at the Grant Parish Sheriff’s Office on Cypress St.
Covington at the Police Station E. Kirkland St.
West Monroe at the Police Station on N Seventh St.
Additional meet-up locations can be found online at SafeDealZones. Contact the Law Offices of L. Clayton Burgess, personal injury attorney, to schedule a free consultation!